Jac Jemc's first novel, My Only Wife, was released from Dzanc earlier this year. 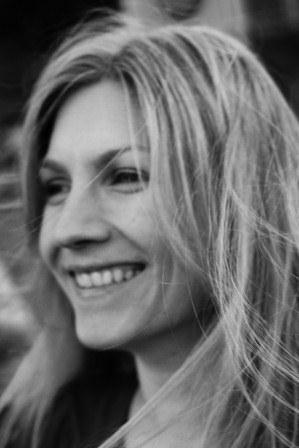 She is the poetry editor for decomP and a fiction web editor at Hobart. She blogs her rejections at jacjemc.com. Please come see Jac and the rest of our talented readers at 7:30 pm on Tuesday, November 6, for our 51st edition of Tuesday Funk at Hopleaf's upstairs lounge. A New Orleans native, Mary Lorenz relocated to Chicago five years ago for a job and a mad craving for Rainbow Cone. A copywriter by day, Mary Lorenz spends her free time writing and performing in and around Chicago - oftentimes for actual audiences. These days, you can find her performing at Chemically Imbalanced Theater with the house team A Dozen Red Roses or as a cast member with Laugh Out Loud Theater in Schaumburg. 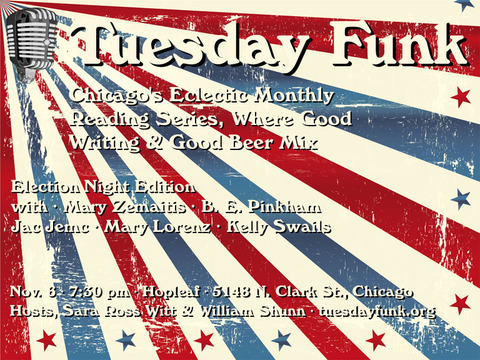 Please come see Mary and the rest of our talented readers at 7:30 pm on Tuesday, November 6, for our 51st edition of Tuesday Funk at Hopleaf's upstairs lounge. Mary Zemaitis won her second-grade writing contest for the groundbreaking story "The Stolen Princess." The piece documented a sea princess's struggle against underwater witches. It is considered Mary's definitive work because her teacher laminated it. Pretty much downhill from there. As an adult, Mary performs stand-up, improv, and sketch comedy around Chicago with Salsation and One Group Mind. She has been featured in Beast Women Cabaret, 100 Proof Comedy, and Mortified. Follow her on Twitter at @Zemidas_Touch. Kelly Swails is a writer who pays the bills by editing an online scientific journal. Her short fiction has appeared in several anthologies including "Predator and Prey 2" and "Boondocks Fantasy." She and her husband are in the process of moving to Chicago. When she's not working, writing, commuting, or packing, she knits and plays guitar. There's a rumor she sleeps on occasion, but that has yet to be proven. You can find her online at www.kellyswails.com. Please come see Kelly and the rest of our talented readers at 7:30 pm on Tuesday, November 6, for our 51st edition of Tuesday Funk at Hopleaf's upstairs lounge. 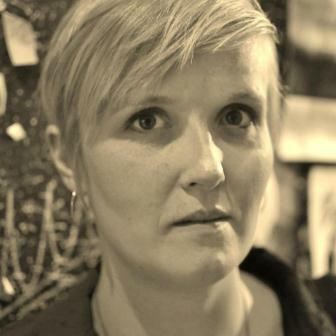 B. E. Pinkham has held various paying jobs in commercial photography, interior design and customer service management but considers her true career to be as non-market skill specialist in the disciplines of creative writing, visual art and community building. Originally from Long Island, she moved to the Midwest and earned all the fine arts degrees she could ever want, including an MFA from the School of the Art Institute of Chicago. Later, she rehabbed apartment buildings and had all the tenants she would ever want. Later still, she gave birth to all the children she would ever want. Since then, she's been writing. She hasn't written everything she wants yet. She is fascinated by water, houses and trees both as metaphors and as physical entities. Consequently, she lives near the lake in Chicago, in an old bungalow under a large copper beech tree. At Tuesday Funk, she will be reading from her as yet unpublished memoir, Let Me Look at You. Her essays and stories have appeared in the anthology, Gravity Pulls You In: Perspectives on Parenting Children on the Autism Spectrum (Woodbine House, 2010), in Brain, Child: the Magazine for Thinking Mothers and in The Examined Life: a Literary Journal of the University of Iowa Carver College of Medicine (Fall 2011). One of her visual artworks (subject: trees, houses.) is currently hanging in the Creative Connections exhibit at the Old Town School of Folk Music in Lincoln Square. Please come see B. E. Pinkham and the rest of our talented readers at 7:30 pm on Tuesday, November 6, for our 51st edition of Tuesday Funk at Hopleaf's upstairs lounge.